It might have been a bit greyer outside than “planned” but St Anne’s buildings were buzzing with colour and activity. The kitchen had been taken over by the Guides who cooked an incredible number of hot dogs and burgers which were consumed with relish! 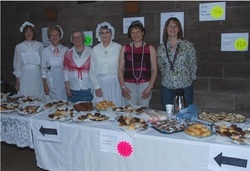 Teas and coffees served in the sanctuary with a generous plateful of delicious homebaking also went well, and musical entertainment while folk sat with their refreshments was much appreciated. The stall holders worked hard, with much wheeling and dealing in evidence. I think first prize for clearing their tables must go to the homebaking stall. Those brave enough to venture outside were entertained by a variety of games including a coconut shy and duck pond!! and the plant stall. There were also some splendid period costumes on display. 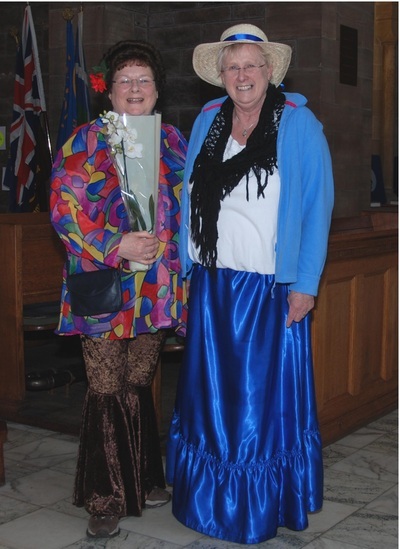 Thanks and congratulations to everyone who gave their time and effort, thanks to Mark for all the organisation and thanks to everyone who came along and made the St Anne’s Church Fair for our centenary year such a success.